Preschool Show and Tell Trauma – Is Recovery Possible?! No one’s an expert on everything. At least that’s my excuse for getting bent over the barrel on buying my kids an annoying $50 Buzz Lightyear toy last week. It happened like this. Some kid at pre-school, named Cody or whoever, brought a Buzz Lightyear toy for show and tell about a month ago. Maybe it was more recent, but 30 days of wailing, whining, pleading and begging sounds about right. My kids, ad nauseum: “But it’s just the COOLEST and you push this red button and the wings come out and there are these other buttons on his arm. And he says, ‘To activity, and beyond!’” Then they pump their little fists in the air as this Buzz thing does. Them: Cries of horror as they realize their mom is the dimmest bulb in the box. Me: A little pissy that they’ve been watching Toy Story videos at daycare on a daily basis. Now, my kids have brought in some damn fine, even cool stuff to Show and Tell. I made damn sure of that after Class #2 when, unaware due to a lack of communication that there WAS such a thing, Simon’s turn came to show off some superfly gadget. The horror in my mind of imagining his classmates’ little upturned faces and the teacher’s arched eyebrows at this display has obviously haunted me ever since. How the hell his dirty sock got in his bag in the first place is one of those Great Unknowns that will likely not be revealed to me until I reach the Afterlife. 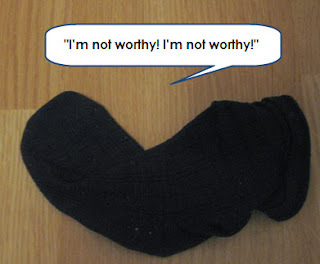 But I do know that no matter what degree of awesomeness I’ve since foisted upon the kids to bring to Show and Tell, no parent can ever undo that first impression of The Smelly Black Sock. So the walking dinosaur on a leash, the Halloween Haunted house that lights up which required my bringing extension cords and arranging the event with the teacher in advance, the Guitar Jamz Simon brought and his little performance in a cowboy hat followed by, “Thank you, thank you very much,” Elvis-style. Jack’s fake Jelly Fish tank that lights up. None of it can undo the Smelly Sock Debacle. Naturally, I now check their backpacks religiously before sending them off to preschool on Show and Tell Day….